2-4pm Starbucks on Decoto Rd. 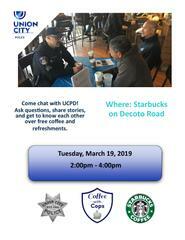 Come chat with UCPD! Ask questions, share stories, and get to know each other over free coffee and refreshments.